It’s not a dogwood but when in bloom, it is a stunning lookalike and a good substitute for the spring-blooming dogwood for showy white flowers. It’s the doublefile viburnum (Viburnum plicatum tomentosam). It is a large shrub and needs a wide space to grow. Ours is close to 9′ tall and the branches spread horizontally almost as wide as as it is tall. In the spring, each layered branch is thick with white, flat flowers that are about 3″ in diameter. The outer ring of florets are sterile and the small buds in the center, yet opened, are the fertile blooms. In the fall, these fertile flowers produce a profusion of red fruit that darken to black, but I hardly have time to photograph them before the birds consume them. By far, it’s the most relished bird food in my fall garden. The blooms stand in paired rows or in ‘doublefile’ above the stems like little soldiers. And it’s just as beautiful from our second story window as from the ground. In the fall, it produces a lovely display when the leaves turn a firery deep red and in winter, the gray bark is interesting as well. Truly, the doublefile viburnum is a fabulous multi-season shrub. It’s that time of the year. Temperatures are warming and ponds and vernal pools have been full of activity around our neck of the woods. Sadly, our neighborhood street cuts right through a wetland so we see water turtles following the pathway from one section to another for egg laying, which takes them right across our road. A common turtle seen crossing our road is the eastern painted turtle (Chrysemys picta), often a pregnant female on her way to lay eggs. To prevent road kills, drivers are encouraged to avoid turtles on the roads and, if conditions are safe, carefully pull over to help them onto the side of the road in the same direction the turtles are heading. 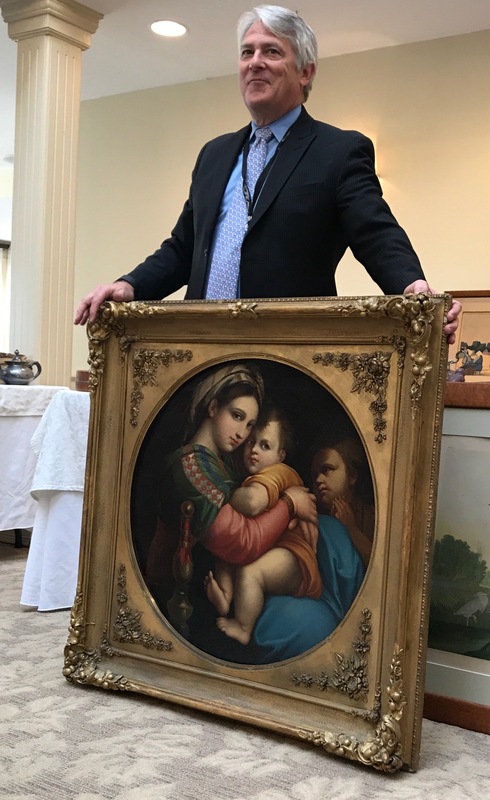 I put this one down on the side of the road and in seconds, it was on its way…. We have so many National Days for this or that, it’s gotten a little ridiculous, but today is officially National Apple Pie Day. Doesn’t it seems a little curious to have National Apple Pie Day in the spring? Wouldn’t it be a whole lot better during fall apple season? Oh well… any excuse to make an apple pie for a friend for Mother’s Day. Most apple pies use similar ingredients in the recipe with slight variations. The first printed apple pie recipe was from a 14th century English cookbook by the cooks serving King Richard II. Can you decipher the Old English? The recipe actually looks pretty tasty. FOR TO MAKE TARTYS IN APPLIS: Tak gode Applys and gode Spycis and Figys and reysons and Perys and wan they are wel ybrayed colourd wyth Safroun wel and do yt in a cofyn and do yt forth to bake wel. Although I don’t use figs, raisins, pears, or saffron, my standby recipe probably tastes fairly similar because of the ‘good’ spices. No hand peeling anymore! 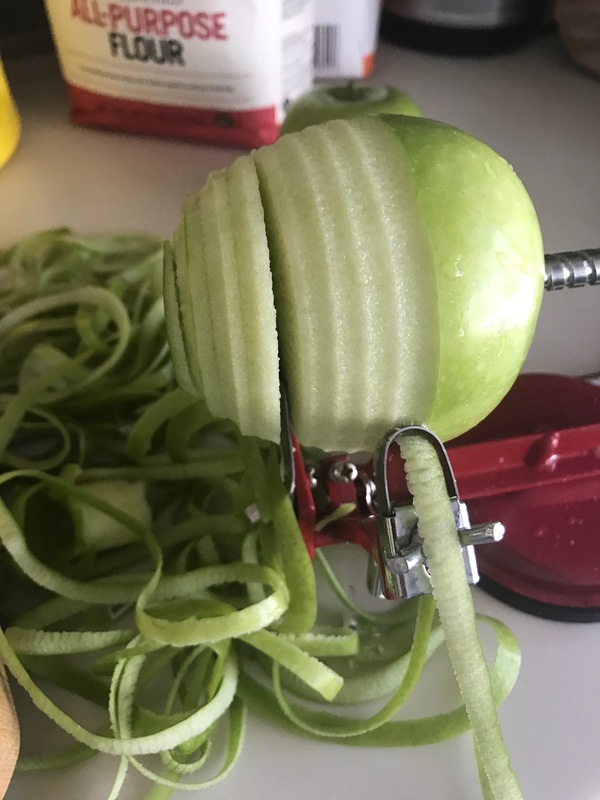 Apples are peeled, cored, and sliced in seconds with hand cranked apple peelers. 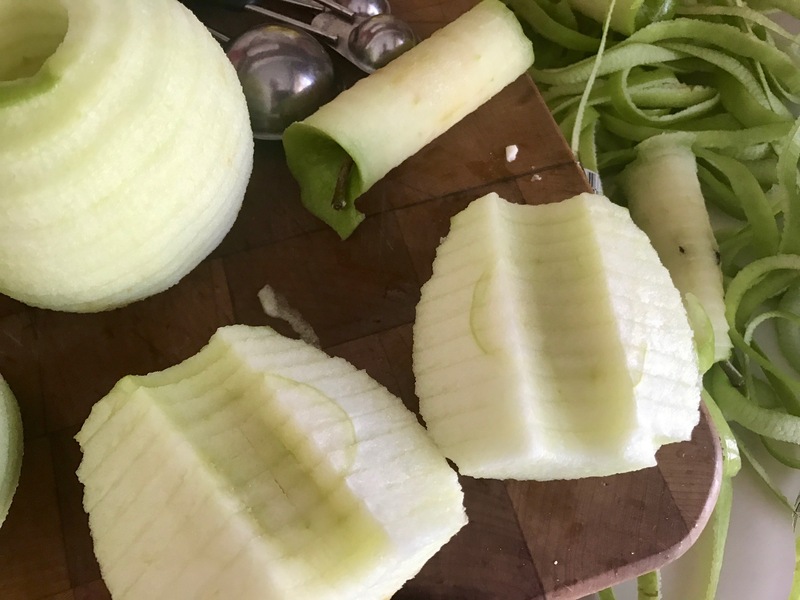 Just like King Richard’s cooks, my apples are seasoned and arranged in a pie crust but what follows makes a difference. I mix flour and sugar and cut in pats of cold butter (Hint: Using a grater for the butter works well) to form a crumb mixture, then sprinkle it pretty evenly all over the pie…. and I don’t skimp! When baked, the crumb mixture forms a golden, crunchy topping on a pie that’s hard to resist. But I must resist for this is a gift for Mother’s Day. Here’s hoping mothers everywhere… especially my two daughters who are wonderful mothers… have a Happy Mother’s Day! Sweet Woodruff is certainly all that! Aptly named, this tiny ground cover offers up the sweet aroma of vanilla or mowed hay when the foliage is crushed. I tried to grow this shade loving herbal in Virginia but it suffered in the summer heat… never died but never thrived. Now in zone 5b-6, my sweet woodruff (Galium odoratum) is a well-behaved and dense ground cover in a shade garden. I am thrilled. It spreads by stolons and rooting in place and some insist it will take over a perennial bed. If it does, that’s fine. I have it planted beneath the shade of a crabapple and among woody shrubs. It it wants to venture beyond, I will face that when the time comes. It is shallow rooted so I don’t think it’ll ever be a weedy thug like English ivy or vinca minor or mint or bungleweed or dead nettle… that I have waged wars against in other garden settings. The delicate flower buds are ready to unfurl their white petals on each of the whorled leaves above. 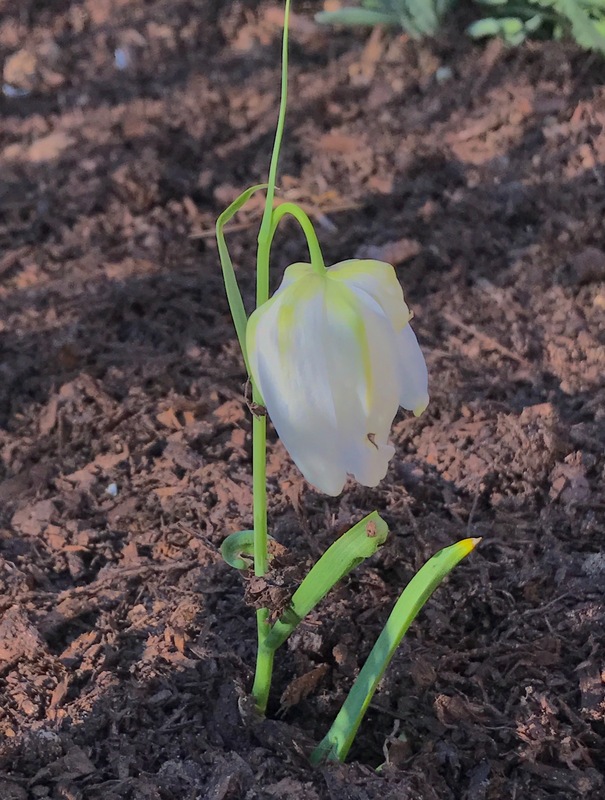 It can grow taller, but mine grows only 6″ tall on slender stems. 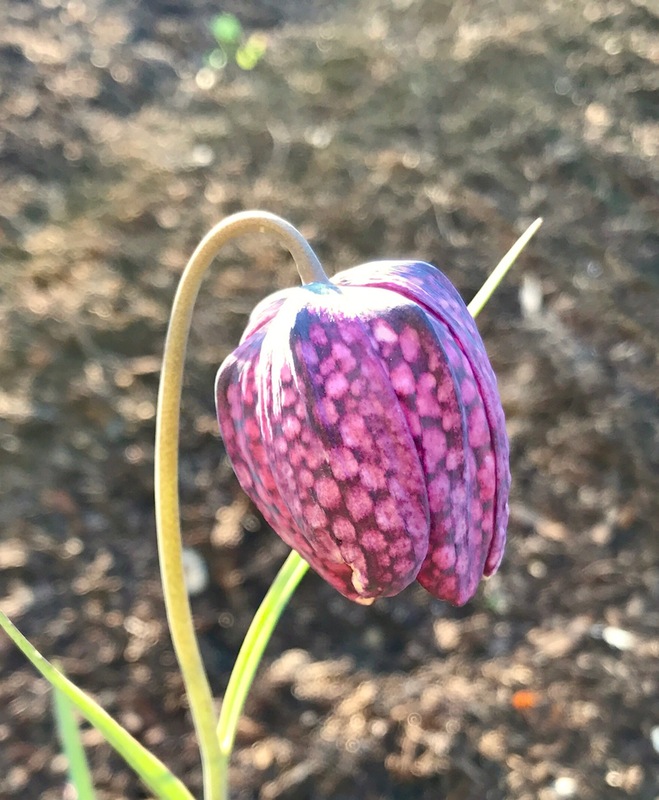 It may go dormant in a drought like we had last summer, but is happy and flourishing in the cool, wet weather we’re enjoying in this 2017 spring. Although I haven’t done it, folks harvest and dry the leaves for potpourri… or it’s used for perfumes and a bit of German wine-based punch. Not for me. This sweet woodruff will serve its purpose solely as a beautiful spring blooming ground cover. How divine! Sweet Woodruff (Galium odoratum): The generic name comes from the Greek word ‘gala,’ meaning ‘milk,’ as the leaves were once used to curdle milk. Odoratum is Latin for ‘fragrant.’ Hardy Perennial in zones 4 – 8; Native to much of Europe. 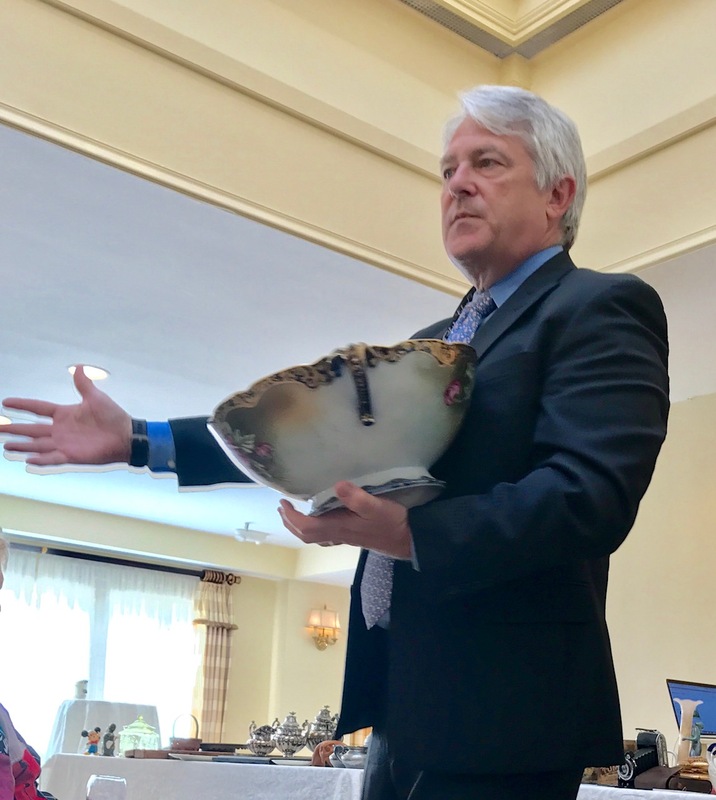 We were invited to a local presentation and appraisal by PBS Antique Roadshow’s Stuart Whitehurst last weekend. 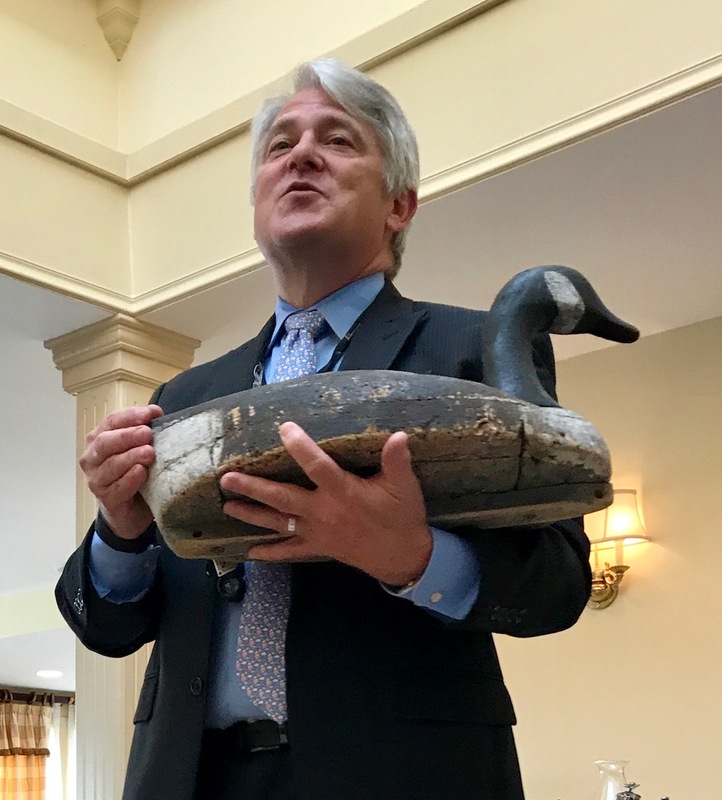 Not only is he ever so skilled at the art of appraisal, he has a talent for entertainment by interacting with those who of us who seemed to bring grandma’s “attic” finds and by keeping us laughing with stories and tales from his many years in the business. 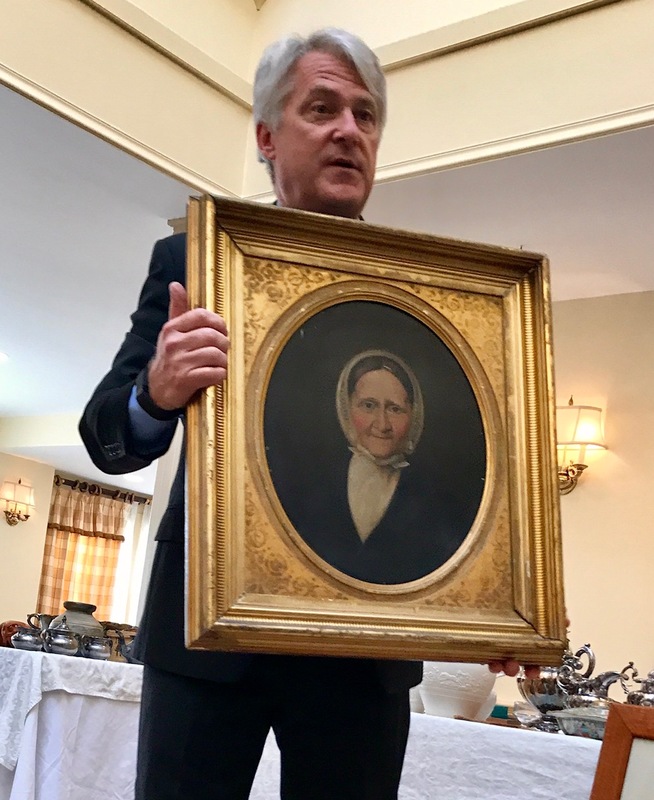 For the most part, folks brought enjoyable and interesting objects: copies of famous paintings, paintings of ancestors, hand-painted and transferware dishes, glass objects, both silver and silverplated objects, and so forth. ….. this very valuable Italian long-neck glass vase. (The lady who sat in front of me said maybe it was for ostrich feathers)…. 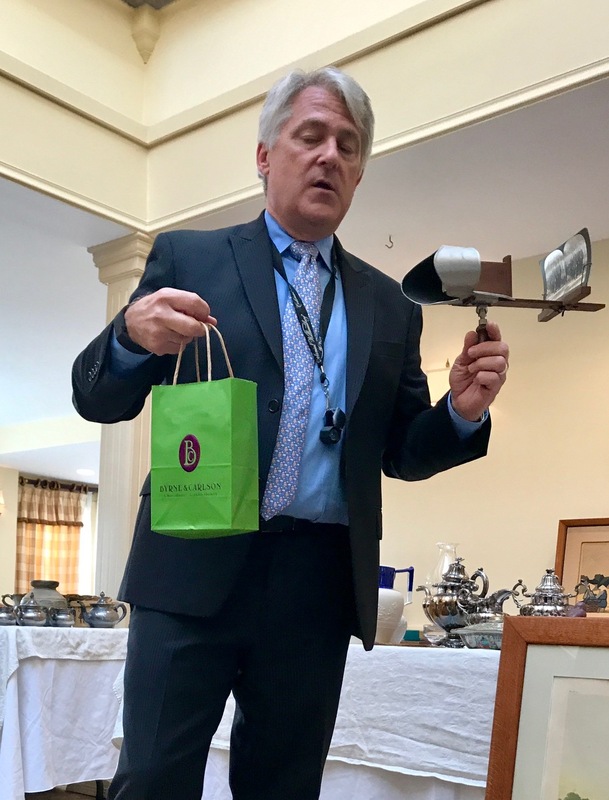 ….and something he’d never seen in a show and obviously made him smile, a 19th-century U.S. Navy commissioning pennant that ran the length of the room! These flags were the mark of a commissioned U.S. Navy ship and flew from the mast. The thirty-six hand-appliquéd stars on this pennant signified the new state of Nevada at the end of the Civil War. It is also called a “Paying Off” flag as the sailors were only paid only when the ship returned home to prevent desertion. 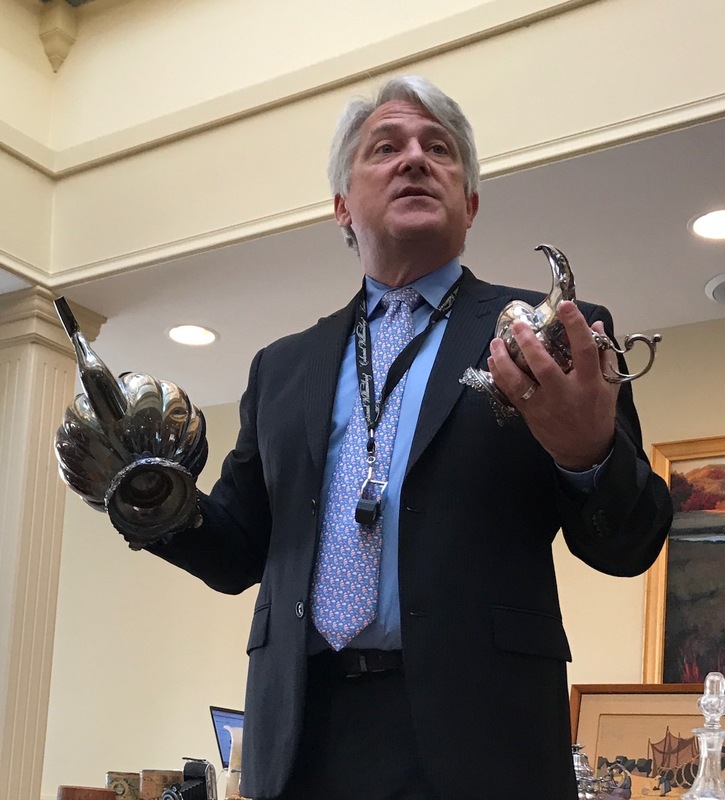 All in all, it was an enjoyable and educational evening… lots of refreshments, lots of interesting people, lots of period pieces, but I did not come away with anything of value (except to me). Sigh…. There’s a nice home nursery that we like to visit in the spring when the owners announce their sale of starter plants. 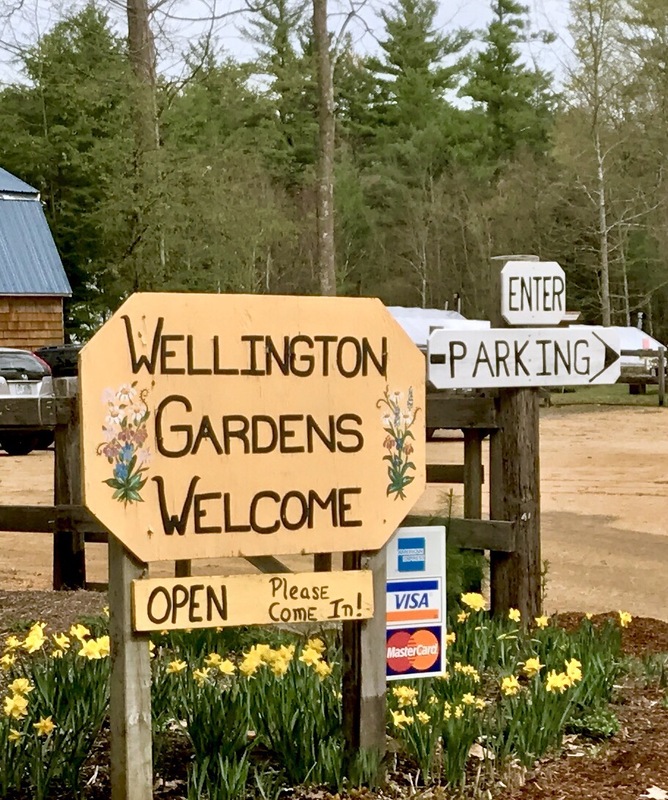 This is our second year to visit Wellington Gardens, located a bit out of the way and tricky to find, down up a long dirt road in Brentwood NH, just 20 minutes from our home. There the family raises all their own annuals and perennials in their 5 greenhouses and offer great early sales at a time when we are itching to plant. 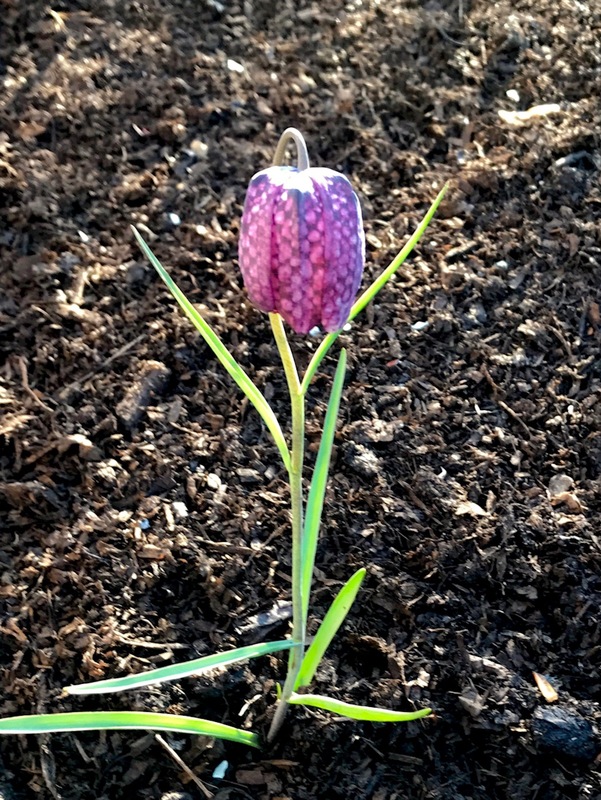 Last weekend, the tiny starter perennials were on sale and we were among the first customers that day…. just before the parking lot overflowed with autos. Shoppers wandered in and out of the greenhouses shopping for vegetables, herbs, and annuals but it was the tiny perennials that were on sale this day. I like to buy small and allow the roots to develop in my own garden and, gee, their starter plants were perfect. They are lovingly cared for and quite healthy… all grown from seed. Although perennials were what we were after (and I did pick out a few), I happened to spot their spectacular hanging baskets in one greenhouse. I couldn’t go home without one of the annuals hanging baskets, healthy and packed full of goodies. Nothing like the root bound, dry baskets you find at the big box stores! How could I resist?? This weekend is the big sale of annuals at Wellington Gardens, only $1.75 for 6-packs…. a Mother’s Day special. I think we’ll be there for the plants for sure, but also to visit Linus, the resident 18-year old African sulcata tortoise that comes ‘running’ when she sees company. I should take her a few strawberries, yes?